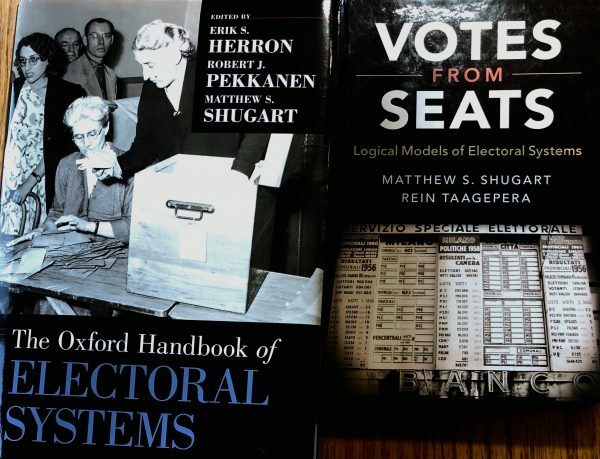 Add the OHES to your electoral-systems book collection! Now you can have them both! No subject is more central to the study of politics than elections. All across the globe, elections are a focal point for citizens, the media, and politicians long before–and sometimes long after–they occur. Electoral systems, the rules about how voters’ preferences are translated into election results, profoundly shape the results not only of individual elections but also of many other important political outcomes, including party systems, candidate selection, and policy choices. Electoral systems have been a hot topic in established democracies from the UK and Italy to New Zealand and Japan. Even in the United States, events like the 2016 presidential election and court decisions such as Citizens United have sparked advocates to promote change in the Electoral College, redistricting, and campaign-finance rules. Elections and electoral systems have also intensified as a field of academic study, with groundbreaking work over the past decade sharpening our understanding of how electoral systems fundamentally shape the connections among citizens, government, and policy. This volume provides an in-depth exploration of the origins and effects of electoral systems. You can find more information, including the table of contents, at the above link. One common note of confusion I have seen in media accounts is insufficient clarity about the distinction between alliance (or “coalition”) and party. The design of the electoral system is fundamentally one that works on pre-election alliances, each consisting of one or more parties. Obviously, if an “alliance” consists of only one party, it is just that–a party. Rather than invent some encompassing term, I will use “alliance” when referring to the set of vote-earning entities (that would be a “more encompassing term”!) that includes pre-electoral coalitions, and “party” only when looking at the sub-alliance vote-earning entities. In the case of the Five State Movement (M5S), the “alliance” and “party” are the same thing. In the case of the other two main entities, they are different. Centrodestra (Center-right, or CDX) is a pre-electoral alliance consisting of the Lega, Forza Italia, and other parties. Centrosinistra (Center-left or CSX) is a pre-electoral alliance consisting of the Democrats (PD) and other parties. No alliance has achieved a majority of seats. The M5S is the biggest party, while the CDX is the biggest alliance. As the table below shows, CDX leads with 263 seats, with M5S second on 222. The CSX has 118. The total comes to 619. Another summation from the same sources yields 620. I will not worry about the small discrepancy. As an aside, I have seen at least two accounts of the result that have had phrasing referring to no party having won the 40% “required” to form a majority. There is no such requirement. It is true that no alliance or party attained 40% of the overall votes cast. However, the understanding that some authors (even one Italian political scientist writing on a UK blog) seem to have is that had someone cleared 40%, that alliance or party would have been assured of a majority of seats. That is incorrect. In fact, given the way the system is designed (more below), it is highly unlikely that an alliance with just over 40% could have won more than half the seats. Possible, but very unlikely (and we might say not significantly less likely had it won 39.99%). This “40%” idea floating around is just totally wrong. The presentation of the overall result leads me to a second key point: the outcome is not terribly disproportional. However, it would be wrong to conclude from this observation that the electoral system was “proportional”. It is not designed to be such, and the disproportional elements of the design have significant consequences that I shall explain. In terms of the Gallagher index of disproportionality (D), the result, based on alliances, yields D=5.40%. That is slightly greater than the median for my set of over 900 elections, and somewhat less than the mean of the same set (4.9 and 7.1, respectively). It is very slightly greater than the mean for PR systems (4.6; median 3.8). Thus, based on the outcome measure of disproportionality, the Italian system looks like a moderately disproportional variant of PR. however, it is not a PR system! We do not ordinarily classify electoral systems based on their outputs, but on their rules. By that common standard, the Italian system is not PR, it is mixed-member majoritarian (MMM). It consists of two components–one that is nominal and the other than is list. The nominal component is plurality rule in single-seat districts, while the list component is nationwide PR (for alliances or parties that clear the threshold). Crucially the list seats are not allocated in compensatory fashion, but in parallel; this is the feature that makes it MMM, not MMP. Unusually for MMM, but not disqualifying it from that category, the list-PR component is a good deal larger than the nominal (plurality) component. The nominal component is only around 35% of the total. However, the lack of compensation means that any alliance (or party) that can win pluralities in a substantial number of single-seat districts (SSDs) will be over-represented even after adding on all those list-PR seats. And such over-representation is precisely what happened. If we look at the 398 list-PR seats and their allocation to parties (and here I do mean parties), we see a substantially more proportional output than overall. The Gallagher index is D=3.93%. This is, as reported above, right near the mean and median for pure PR systems. Just as we would expect! And most of the disproportionality comes from parties below the threshold, not from disparities among the over-threshold alliances. Around 4% of the vote was cast for alliances (or individual parties) that did not qualify for any seats. Some other votes are lost due to a provision that sub-alliance parties that get under 1% of the vote also have their votes wasted. If a party is between 1% and 3%, its votes are still credited to the alliance of which it is a part, even though such a party is barred from winning any seats in the list component. Focusing on some of the major parties, we see that the major CDX partners were not much over-represented in the list component of the system: Lega has 17.4% of the vote and 73 seats (18.3%) for an advantage ratio (%seats/%votes) of A=1.05. Forza Italia has 14% of votes and 59 seats (14.8%) for A=1.06. The second largest alliance, the stand-alone party M5S has 32.7% of votes and 33.7% of seats for A=1.03. In the CSX, the PD is more over-represented, with 18.7% of the votes but 91 seats (22.9%), and A=1.22. I suppose this is because its partners mostly failed to qualify for seats, but the votes still get credited to the alliance (as explained above), and hence to the PD. We see from these results that, with the partial exception of the PD, the parties are represented quite proportionally in the list-PR component of the MMM system. What gets us from D=3.93% in the list component to D=5.40% overall is precisely the fact that the nominal tier of SSDs exists and favored, as one would expect, the larger alliances. The following tables shows just how dramatic this was. The vote percentages are the same as those shown in the first table, because there is no ticket-splitting between the two components. Each alliance presents a single candidate in each district, and the voter can vote for either a party list or an alliance candidate. Votes for a list are attributed to the candidate, and a vote for the candidate is proportionally divided among the lists in the alliance that nominated the candidate (with the previously noted caveat about parties whose national vote is in the 1-3% range). The seats in the nominal component are distributed quite disproportionally: the largest alliance, CDX has nearly half of them, despite only 37% of the vote. The M5S is also over-represented, with about 40% of seats on just under a third of the votes. As is typical under SSDs with plurality, the third-place finisher, CSX, is significantly underrepresented, with a percentage of seats not even half its votes percentage. Also as is typical, candidates often won their district seats on vote percentages in the low 40s or less. The mean district winner had 43.9% of the vote. For the M5S the mean was 45.4%, while for CDX it was 43.7%. As might be expected for a third force winning some seats, the CSX tended to benefit most of all from fragmented competition, with its mean winner having 39.2%. The lowest percentage for any SSD winner was 24.1% (M5S in Valle d’Aosta). Four winners had over 60%, including two from M5S and two from CSX; the maximum was 65% (CSX in Trentino-Alto Adige/Südtirol). The media focus is on the “inconclusive” result, and many are blaming “PR” and the failure of any party (or alliance) to reach 40% of the votes for the lack of a “clear” verdict. However, we have seen here that the system is not proportional, even if the overall level of disproportionality is modest. If the entire system had been based on the allocation used in the list-PR component, we would be looking at CDX with 38.7% of seats, M5S with 33.7%, and CSX with 23.6%. However, given the actual MMM system, and its inherent disproportionality, the result is CDX 42.5%, M5S 35.9%, and CSX 19.1%. The non-PR aspect of the system thus has made a difference to the seat balance. The bargaining context would be difficult either way, but the two largest alliances are both boosted somewhat by features of the electoral system. Had the leader reached 40%, it would have netted only slightly more seats, surely still short of a majority, because–contrary to some claims circulating–there was no guarantee of a seat majority for reaching any given vote percentage. To form a majority of parliament, an alliance would have to win a very large percentage of the single-seat districts as well as some substantial percentage of the votes (probably a good deal higher than 40%). That the outcome is “inconclusive” says more about the divisions of the Italian electorate than it does about the supposed problems of a proportional system that Italy doesn’t actually have. Thank you to Gianluca Passrrelli for sharing the link from which I based my calculations and for his excellent chapter in the forthcoming Oxford Handbook of Electoral Systems. Chile has presidential and congressional elections 19 November. Unfortunately, an article at AS/COA does something that is far too common in media coverage of Latin American elections: It ignores the congressional elections. The Senate seat product is also being increased, but only half that chamber is elected at a time, so the new system will not be fully implemented till four years hence. As shown in a table of polling trends for the presidential election (first link), there is more of a contest for second place and thus entry into the runoff than there is for first place. Former president Sebastián Piñera is leading but not likely to clear 50% of the valid vote. Two leftist candidates are vying to face him in the expected runoff. Now, the pressure to join forces for assembly elections is reduced, which should be expected to push up the number of viable contenders for presidential-runoff slots as well. The candidates vying for that second slot are Beatriz Sánchez, backed by an alliance called the Broad Front (Humanist Party, Liberal Party, Green Ecologists, and others), and Alejandro Guiller, backed by Fuerza Mayoría (including the Socialist Party of the outgoing incumbent, Michelle Bachelet, as well as the Communists, Democrats, and others). Which one will make it, and how will it affect the left’s combined chances of blocking a victory for Piñera in the runoff? And how will the candidates help (or not) their alliances’ electoral process in the new congressional election? UK election 2017-any hope for electoral reform? One of the most remarkable things about the UK election was the total number of votes cast for the top two parties, which increased from 67.3% in 2015 to 82.8% this year. It has been less noticed, however, that this has come with a substantial drop in the Gallagher (least squares) Index of disproportionality. From 15.02 in 2015, it has more than halved to 6.41, a figure actually larger than that in Ireland in 2011, Germany in 2013, or Poland in 2015. This is largely due to the absence of a large third party discriminated against by the single-seat plurality system. No established minor party outside Northern Ireland gained votes, with UKIP and the Greens both falling to below 2% and even the Liberal Democrats slipping back slightly in terms of votes despite picking up four seats. The (unusual, as Shugart points out) absence of an unearned majority for either party also contributed to the low score. There also seems to be some evidence from past UK election results that two-party elections tend to be more proportional. Between the 1950 and 1970 elections, when support for the Liberals (the only substantial third party) never exceeded 11.2% (and was generally substantially below this), the Gallagher Index averaged only 6.41; since then, with the until-recent presence of the SDP-Liberal Alliance/Liberal Democrats, it has stayed high as can be seen above. The number of very marginal seats has also increased substantially at this election, as can be seen above. While other readers may disagree with me on this, I personally view a higher number of marginals as good for the status quo, given that it means more voters view their votes as having an impact upon the result. This is not necessarily a result that would appeal to the major parties, but it would seem to act to quell public concern over the current system. The growth of the top two creates a problem for electoral reform advocates. Which party, exactly, benefits from implementing proportional representation? The Labour and Conservative parties obviously have no personal interest in PR. The Liberal Democrats, at present, are far too weak to extract such a concession (even with 57 seats in 2010, the best they could do was a referendum on AV) in a coalition, as are the Great British regionalist parties (which would probably be heavily expected to go with Labour anyway, weakening their leverage) and the Greens (much the same reason). Labour’s manifesto makes no specific mention of proportional representation, while the Conservative manifesto goes further, calling for single-seat plurality to be adopted for mayoral and Police and Crime Commissioner elections. Shadow Chancellor John McDonnell has gone on record in the past as being in favour of proportional representation, but I suspect now Labour are at 40% that proposal will be soon forgotten. While the past two months has demonstrated conclusively that much can change in a short time in UK politics, it’s difficult to imagine that proportional representation could gain any traction in a political system dominated by the top two parties after failing to gain traction (at least for the House of Commons) in nearly thirty years of three-party politics.